Labor party officially endorses MK Binyamin Ben-Eliezer as its candidate for president. The Labor party on Monday officially endorsed MK Binyamin Ben-Eliezer as the party’s candidate for Israel’s President. All of Labor’s MKs voted in favor of the endorsement, Channel 2 News reported, with the exception of MK Shelly Yechimovich who abstained. Ben-Eliezer served as an IDF Commander in the 1967 Six Day War and in the 1973 Yom Kippur War. In 1977, he was appointed First Commanding Officer in Southern Lebanon, serving as the army liaison between the Lebanese Christian militias and Israel. He was Military Governor of Judea and Samaria between 1978 and 1981 and was Coordinator of Government Activities in Judea, Samaria and Gaza from 1983 until 1984. 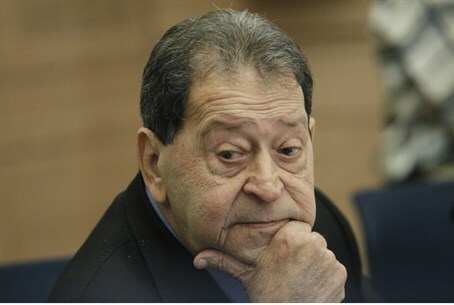 Ben-Eliezer first entered the Knesset in 1984 and has served in a number of ministerial posts, including Defense Minister in Ariel Sharon’s first government between 2001 and 2002. Channel 2 News reported that Ben-Eliezer has become the first candidate to have the signatures of ten MKs for his presidential bid, thus ensuring he will be a candidate. The race to replace Shimon Peres, whose term ends this summer, is a heated one so far, with many people having so far declaring their intention to run. Another former Knesset Speaker, Dalia Itzik, has begun to collect signatures from MKs, with Shas’s Yaakov Margi being the first one to sign for her. Shechtman made negative headlines on Monday after comments he made about music that was not of Sephardic origin were made public. "To sustain the soul we need poets, and painters, and singers - not only of Mizrachi (Sephardi) origin. It's preferable that we have other singers," said the Nobel Laureate, evoking condemnation from Shas Chairman MK Aryeh Deri. Shechtman's associates denied that the statements were discriminatory, and passed off the allegations as baseless. The public, meanwhile, believes that Rivlin is the most suitable candidate for president, though it is the Knesset and not the public that decides.